The 33-year-old announced the news via his official Twitter account today. Tommy Bowe has confirmed he will retire at the end of this season. IRELAND AND ULSTER legend Tommy Bowe has confirmed he will retire from rugby at the end of this season. The 33-year-old announced the news via a poem on his official Twitter account today. The official Ulster and Irish Rugby accounts were among those to pay tribute to Bowe following the announcement. The winger will bring to an end an illustrious career come the end of the current campaign. He made over 100 appearances in two separate spells with Ulster, between 2003 and 2008, and from 2012 to the present. In between, he had a successful spell with Ospreys in Wales. For Ireland, he has scored 150 points in 69 appearances, winning IRUPA Players’ Player of the Year in 2008 and 2010. The Monaghan native was also part of two separate British and Irish Lions tours in 2009 and 2013. He has continued to be involved in the Ulster and Ireland set-ups in recent times, though injuries have restricted his game time of late. Among other fine moments, his try against Wales in 2009, which helped secure Ireland secure their first Six Nations Grand Slam since 1948, will live long in the memories of Irish rugby fans. Email “Ireland and Ulster legend Tommy Bowe to retire at end of season”. 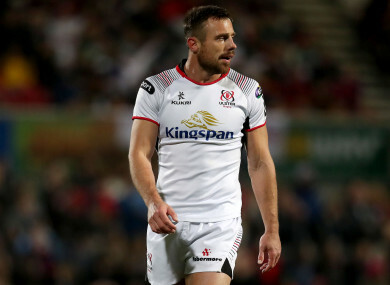 Feedback on “Ireland and Ulster legend Tommy Bowe to retire at end of season”.